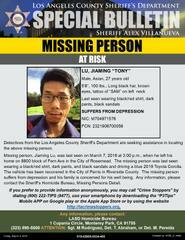 Los Angeles County Sheriff’s Department’s At Risk Missing Persons Unit detectives are seeking the public’s assistance in locating Jiaming Lu. Mr. Lu was last seen on Thursday, March 7, 2019, at 3:00 p.m. when he left his home on the 8800 block of Fern Avenue in the City of Rosemead. 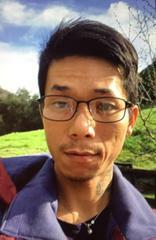 Mr. Lu is described as a 27 year-old male Asian, 5’6”, 100 lbs., long black hair, brown eyes and has a tattoo of “SAM” on the left side of his neck. He was last seen wearing a black/red shirt, dark pants, and black sandals and driving a blue 2019 Toyota Corolla. The vehicle was recovered in the city of Perris in Riverside County. Mr. Lu suffers from depression, and his family is concerned for his well-being and asking for the public’s assistance in locating him.